Bruce Friedrich has been a vegetarian for 30 years but he has recently been enjoying the taste of meat again. The burgers he has been tucking into have been described by Bill Gates as “the future of food” – lab-grown meat culled from the cells of animals. Mr Friedrich was at the TED (Technology, Entertainment and Design) conference to talk about how lab-grown meat could feed an ever-increasing population and solve environmental issues. The firm Beyond Meat was also in Vancouver to give delegates a taste of its plant-based meat substitute. Beyond Meat, along with Silicon Valley firm Impossible Foods, are already offering plant-based meat alternatives but there are dozens of firms experimenting with developing meat products which takes the cells of living animals and ‘grows’ meat from them. Mr Friedrich thinks the general public will get their first taste of cell-based meat in 2020 but, initially at least, will have to pay a premium of around $50 (£38). The founder of the Good Food Institute, an organisation supporting the creation of plant and cell-based meat, has become one of this year’s TED fellows. His think tank has ploughed $2.8m (£2.1m) into 14 projects which are developing ways to grow meat and scale it up to mass production – and hoping to get the price tag down in the process. Cultured meat, or clean meat as it is sometimes called because of its low environmental impact, has the ability to transform farming, Mr Friedrich told the BBC. “We grow a massive amount of crops just to feed farm animals. For every nine calories we put into a chicken we get one calorie out. It is a fantastically inefficient way to create food,” he said. The demands of an ever-growing population, coupled with the environmental impact of intensive farming, means farmers have to look at alternative ways of producing meat, he said. “We are not going to change human nature so we just have to change the meat,” said Mr Friedrich. 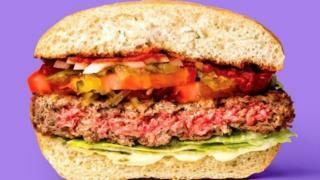 And this new age of synthetic meat has little to do with vegetarianism. “We hear vegetarians say that they don’t want to eat these products and we say, partly joking, that we really don’t care what vegetarians think of it,” he said. A clean meat “farm” will look very different – more like a brewery than a farm – and would not require any animals, said Mr Friedrich. “The cells of the animals would be immortalised in cell banks,” he explained. “It would require 99% less land which means that farmers can move away from the ‘get big or get out’ theory of farming. Traditional crops like millet might see a comeback and farmers would be able to work “more in tune with the soil”. This may seem like an idealised view of the future to some but already meat alternatives are going mass market. A vegan sausage roll launched at UK bakery Greggs in January caused a flurry of headlines and a spike in the company’s profits. Meanwhile, Burger King is trialling its Impossible Whopper in 59 restaurants in the US with plans to roll them out across the country. Burger King’s new veggie burger is made by Impossible Foods, which develops plant-based products that replicate both the taste and texture of real meat. Its ‘secret’ ingredient is heme, an iron-containing molecule that is credited by some with giving meat its ‘meaty’ taste. Before heading to the TED conference in Vancouver, I took a detour to a restaurant called Meet in the city’s famous Gastown district. It is one of a chain of places serving Beyond Meat burgers. As a pescatarian who had not eaten meat for 20 years, this was a new challenge. At first inspection, the “meat” has the texture of the real thing but it was hard to say whether it was truly meaty, due to the amount of garnish in the burger. The restaurant was packed with diners, all of whom seemed to be enjoying the plant-based meat. Later, at TED I caught up with the company behind the burger and had another taste of their product, this time just a naked burger unadulterated with sauce or salad. It doesn’t taste like Quorn – the meat alternative I am most familiar with – but it doesn’t entirely taste like my memory of meat either. I enjoyed it but, as Mr Friedrich points out, I am not the target audience. How convinced meat-eaters will be, I am not so sure. Both Impossible Foods and Beyond Meat currently develop plant-based meat but there are also dozens of firms working on lab-based meat in Europe, the US, China, Japan and Israel. And regulators are beginning to understand that they need to play a part, said Mr Friedrich. In March, the US Food and Drug Administration produced a memorandum of understanding about how it would regulate the nascent industry in collaboration with the US Department of Agriculture, putting it on a more equal footing with more traditional food stuffs. In countries that have food security issues or those, like India and China, which have to feed vast populations, Mr Friedrich anticipates that regulators will “roll out the red carpet” to firms offering lab-based meat. The Bill and Melinda Gates Foundation has flagged cellular agriculture as one of the five food technologies that could bring about real change in developing world. But not everyone will be joining the revolution. The UK’s Vegan Society told the BBC: “We sympathise with the development of clean meat as it has the potential to eliminate animal suffering and reduce the environmental impacts associated with animal agriculture. To Be Ethical, AI Must Become Explainable. How Do We Get There?